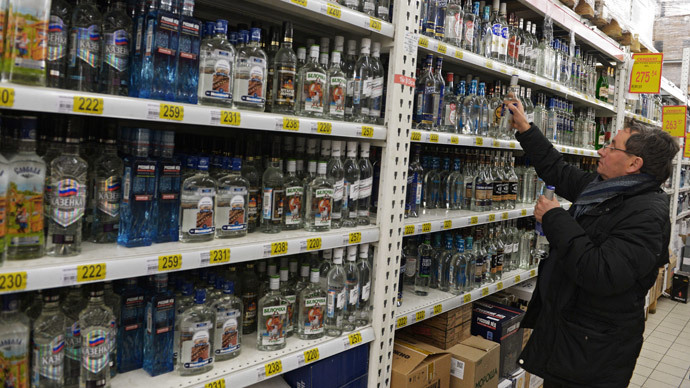 Russian authorities have rejected a registration application from the Russian Prohibition Party, but activists vow to continue their fight against the menace of alcohol. Party Chairman Valery Melekhin told TASS that the Justice Ministry found four faults to preclude registration. He did not specify what they were, but noted they would soon be corrected. Melekhin noted that his movement had already submitted the amended registration application and expressed hope that next time it would be accepted. Melekhin also reminded the news agency that the Prohibition Party’s founding convention took place in December 2012 and the unregistered group already has branches in 52 Russian regions. The law requires that political parties launch branches in at least 43 of the 85 Russian regions within six months of the registration or it is recalled. The movement positions itself as ‘social-patriotic’ and the peak of its activities fell in 2014 when Russia celebrated the 100th anniversary of the ‘dry law’ introduced by the Russian Emperor with the start of WWI. The activists repeatedly emphasized that they are not in opposition to any political movement, but fight against the general “inhumane policies” of alcohol traders. The anti-alcohol argument is being used by various political forces in Russia, from radical nationalists who promote the ‘Russian means sober’ slogan, to centrists and conservatives who sponsor radical limitations on alcohol sales both on the federal and regional levels. In 2014, Russia introduced a nationwide ban on alcohol sales from 11pm till 8am local time for all vendors except officially registered cafes and restaurants. In 2012, the authorities almost completely banned the advertising of alcohol beverages and beer. In 2011, the WHO put Russia in fourth place in Europe by alcohol consumption with 15.76 liters per capita. According to the Russian Health Ministry, this figure fell to about 13.5 liters in 2013, on a par with France, Austria and Portugal.